This brilliant essay should be mandatory on every school curriculum, especially in the developed world where most of the insanity, violence and vandalism originates. Even though I’ve been aware of nearly all the issues Burrowes writes about for a very long time, the urgency of his message hit me like a ton of bricks. Have I done enough to help? What more can I do? What damage have I already caused, ignorantly or wilfully? How can I prevent further damage to this precious earth by altering how I live? Should I even be alive? It hurts so much knowing that just by being here, by living my life, I have contributed to this horrendous planetary disaster, the deaths, the destruction, the unspeakable violence committed by the human race since day I was born. To make amends is not enough, we must do everything in our might to spread awareness, to educate and to work tirelessly for sustainable and peaceful solutions – before we reach the point of no return. Yes. Important essay. I hope it empowers people to take action as you describe. One of the most important essay ever! I second Lili-Ann’s plea to have it included in curricula, but it is devastating. So there must be a positive conclusion, which for me is the requirement that mid-level “role-players”in the various agencies need to carry out arrests of the actual culprits who authorize this state of affairs, and sequester them appropriately so they can do no more damage. Well I would say; that was truly the most horrifying article I ever read! what are we to do? I didnt even hear anything about microplastics in it which is another terrifying reality we face today, I would say; first it should be government; then business and people; will rise to solve, any given problem. we should teach good judgement as a value, not, educate a powerless people, in the horrors of what they can do little about. If politicians always “lie”, they learn why in political science class, if government is working against solving a problem; then who are we to care? Ive been doing it my whole life, and I will say the truth, people can only take in so much negative serious crap, before they need to escape, to a more promising land, be it real or not. my sympathies go out to, the citizens of the USA, for such a, backwards political performance on the environmental front with the regime switch. 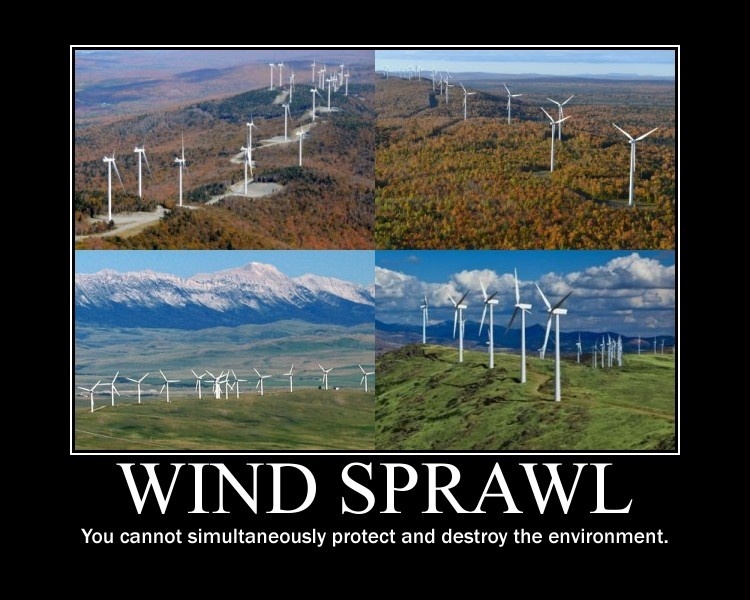 Many of us are dismayed by the extreme size of wind turbines dumped all over farmland and mountaintops for the past few decades. These intrusions have ramped up considerably in the past 10 years. Wind projects are mega-junk when you consider how little carbon they actually reduce for all the blight they cause. Excuses run thick among people claiming to be environmentalists. Too Little. Too Late. Perhaps if this had been written fifty years ago…. Oh, wait, it was. And we ignored it back then when, with action, we might have created a different future for Gaia. This is the question it astounds me so very few are asking. We should be seriously working towards voluntary extinction for H. sapiens, given that there is only one choice facing the world – either we go down eventually (but quite soon, nevertheless) , pulling down with us most life forms higher than bacteria, including all terrestrial vegetation; or we find a way of saving all the good stuff, by removing our own species s certainly and effectively and irreversibly as possible.